The Trackpad preference pane is the place to customize your trackpad settings. The glass trackpad on a MacBook, MacBook Pro, MacBook Air, or the standalone Magic Trackpad, is certainly fun to play with in the store. An Apple salesperson will quickly show you how to scroll, zoom, and right-click, but after you get your new Mac notebook or Magic Trackpad home, some of the things you remember doing in the store may not seem to work the same way. It's not you, and it's not the Apple salesperson's fault either. The difficulty lies in how a Mac is configured by default versus the way most people end up configuring the trackpad. Here are a few tips on customizing your trackpad so that it works the way you want. Launch System Preferences, either by clicking its Dock icon or by selecting System Preferences from the Apple menu. Click the Trackpad icon to open the trackpad preference pane. Click on each of the three tabs: Point & Click, Scroll & Zoom, and More Gestures and select options to customize your trackpad experience. The speed at which the cursor moves across your Mac's screen is a function of both how fast you move your finger on the trackpad and the tracking speed you select. If you're using a mouse instead of the trackpad, you can also increase and decrease the track speed of that mouse. You set the tracking speed, from slow to fast, using a slider in the Point & Click tab. Setting tracking speed to the Slow end of the slider requires you to move your finger farther along the trackpad surface to move the cursor. Using a slow setting allows for precise cursor movements, but it causes maddeningly slow cursor response. It may even require multiple swipes of the finger across the trackpad to move the cursor completely across the screen. Set the slider to the Fast end, and the smallest amount of finger movement sends your cursor whizzing across the screen. Most users prefer to set the slider so that a full swipe of the finger across the trackpad causes the cursor to move completely from the left side of the display to the right side. By default, a trackpad is set for a single click to be accomplished by physically pressing down on the glass trackpad, an action Apple calls a force press. You can feel the glass trackpad give as it is depressed. If you prefer, you can choose a single tap rather than the force press by selecting Tap to Click. The Secondary Click, also referred to as a right-click, is turned off by default. This is a holdover dating back to the original Mac, which had a single-button mouse, but that was so 1984. To move into modern times, you'll want to enable the secondary-click functionality. 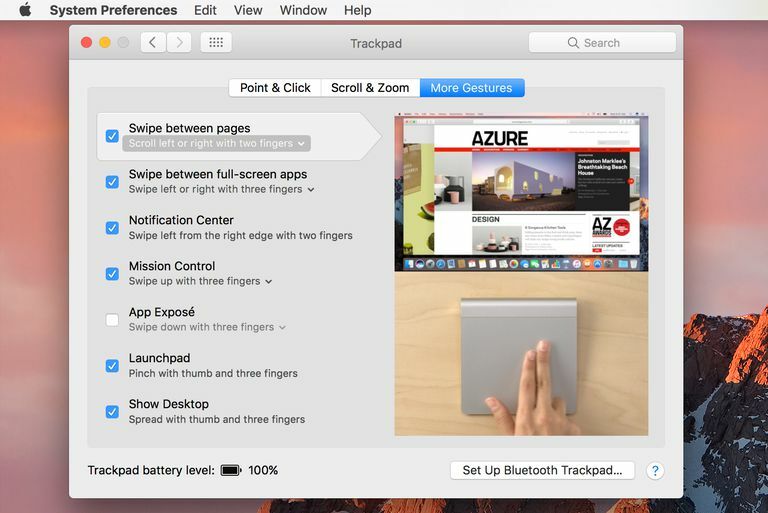 Click with two fingers: enables a two-finger tap on the trackpad as a secondary click. Click in bottom right corner: enables a single click to the bottom right corner of the trackpad to serve as a right-click equivalent. There are two basic categories of gestures. Universal gestures are gestures that all applications can use. Application-specific gestures are only recognized by some applications. Select the Scroll & Zoom tab in the Trackpad preference pane. Scroll Direction: Scrolling is performed by dragging two fingers across the trackpad. You can scroll up, down, and sideways. OS X and macOS support two different scroll directions referred to as natural or not. Natural refers to scrolling using the same method found in iOS devices. This may seem backward for Mac users, so you can change the preference by removing the check mark in the Scroll direction box. Zoom in or out: The two-finger pinch lets you zoom in or out on an object on the screen. To zoom in, place two fingers slightly apart on the trackpad and then bring the fingers together (pinching). To zoom out, place two fingers together on the trackpad and then spread the fingers apart. Smart Zoom: Double tapping with two fingers zooms in. Double tapping a second time zooms out. Rotate: Rotate with two fingers. Other gestures are found in the More Gestures tab. Apple has moved gestures between the tabs a few times, so depending on the version of OS X or macOS you are using, you may find the following gestures in one of the other tabs. Swipe Between Pages moves you back or forward in any application that makes use of back and forward commands, such as a web browser. Swipe Between Full-Screen Apps activates a swiping motion on the trackpad to switch between any open full-screen apps you may be using. Notification Center defines a swipe motion to open and close the notification panel. Mission Control defines a swipe gesture to open Mission Control. App Expose is used to define a swipe gesture to enter Expose. LaunchPad defines a gesture to open the Launchpad app. Show Desktop makes use of a spreading thumb and three fingers to hide open windows and display the underlying desktop. Those are the basics of using the trackpad or Magic Trackpad. You may see additional gestures and settings depending on your operating system version under the various tabs. Try them out to see if they are helpful to you. Remember, you don't have to (and probably shouldn't) enable every gesture type available. When you see instructions for using your Mac, they usually reference mouse clicks. Here is the translation for a trackpad.